This Qur’anic scroll testifies to the level of creativity and dexterity possessed by the artists engaged in copying the holy book. 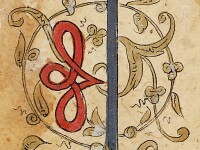 Beginning with an illuminated panel and the surat al-Fatiha (‘The Opener’), the first chapter of the Qur’an, the scroll continues with a sequence of long cartouches filled with the basmala (an Islamic formula that reads ‘in the name of God, the Merciful and the Compassionate’) and sections from the ‘throne verse’ (ayat al-kursi, Qur’an, 2:255) in large thuluth characters. These inscriptions provide the background for the second chapter of the Qur’an, the surat al-Baqara (‘The Cow’), which is written in ghubar script inside the letters, in addition to covering the flower-like decorative motifs and spaces between the various bands. It is likely, considering its contents, that this scroll was used as a talisman.